After the Thanksgiving celebration, many of us (if we haven’t already) turn our thoughts to Christmas decorating. I am thrilled that today’s guest blogger, Mary Soroka, has given us many tips on how to decorate our homes with a personal, yet eco-friendly touch. Enjoy! With the holidays just around the corner, now is the time in which we daydream of red-and-green wrapping paper, decked out trees and magical sparkle galore. 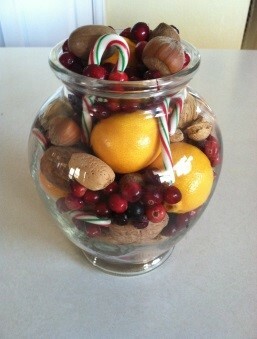 Instead of buying the latest in Christmas glitter, glass or plastic decor, take a more natural approach to decorating. 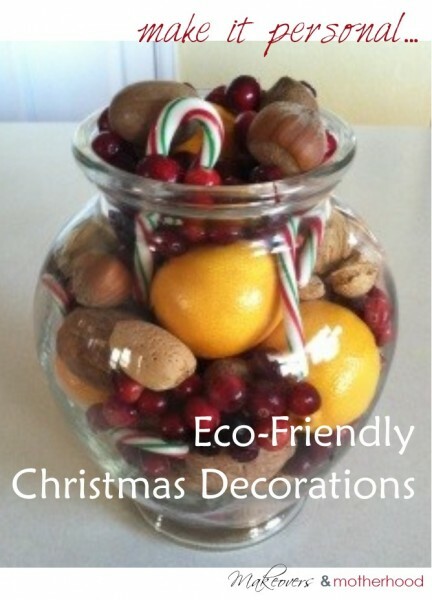 It’s easy to make your own decorations using recyclable and bio-degradable materials. You’ll be doing your part to take care of the Earth and expressing a unique style all your own! Here are some suggestions to get you started. Why not create a unique holiday centerpiece by reusing old bowls, baskets, vases and platters? To make stunning arrangements, fill the containers with natural items from your yard and kitchen. Outdoors: Collect items from your yard and neighborhood. Look for pinecones, pine boughs, seed pods, cat tails, holly berries, leaves and flowers. Kitchen: The possibilities are endless when it comes to kitchen foods. Gather fruits such as clementine, orange, apple, cranberry, lemon and lime. Consider dried chili peppers, avocados, whole nuts, cinnamon sticks or even candy canes to add that festive flair. Sewing: Dig out your needles and colorful threads to stitch together one-of-a-kind ornaments. There are tons of easy patterns available if you need help with basic shapes. Use materials you have around the house such as fabric remnants, cotton balls, buttons, paper, clothes pins, ribbon, pipe cleaners and yarn. Paper Mache: If you’re really ambitious and crafty, you may want to try Paper Mache. Start with tearing newspaper into long strips. Decide on a shape or mold you’d like to use. Some suggestions are balls, balloons, cardboard forms, or shapes made from wire. Finally, you need to make the paste. An easy recipe to try is a mixture of 1 cup flour and 1 cup water whisked together. Dip the newspaper strips into the paste (removing excess) and smooth over your form. You want to have 5-6 layers. Let dry and decorate. Cardboard cut-outs: Quick and easy ornaments can be made from used cards that would otherwise end up in the trash. Cut out the best parts of the covers, punch a hole, and hang. Simple as that! You can also recycle empty boxes from your kitchen. Cut out shapes and color or paint to add just the right touch. Dough: Rolling out dough and using cookie cutters to make shapes is a favorite for kids. Try the super easy salt dough cut-outs. Mix 2 cups flour, 1 cup salt, and 1 cup water. Add coloring, knead, roll, cut-out, let dry and hang. There are also many recipes available for gingerbread or cinnamon ornaments. Not only are these yummy, but they smell and look great on the tree! Natural elements: Collect items from your yard such as pinecones, pine boughs, flowers and holy branches. Food items: Use food you have on hand in your pantry such as popcorn, dried fruits, noodles or candy. Craft supplies: Another great way to make garland is it weave or braid together strips of cloth, yarn or ribbon. You can also use items such as old beads, buttons or cut-out paper snowflakes or stars. Wreaths are beautiful hanging inside and outside the home. Think of using long grasses, pine boughs, holly leaves/branches/berries, seed pods, leaves, nuts, fruits, candy or cinnamon sticks. Just weave any of these items together and secure with hot glue, twine, scraps of fabric, ribbon or yarn and hang on your favorite wall. For a real eco-friendly touch, try stringing the wreath on the outside of your door with solar Christmas lights like these—no extension cords required! Christmas gifts are beautiful under the tree. However, wrapping paper can be a huge source of waste. Why not add a unique touch to your gifts by wrapping them with colorful newspaper ads, magazines pages, fabric remnants, outdated maps or even construction paper decorated by your children/grandchildren. Another idea is to make the packaging part of the gift itself, whether it’s a reusable tote that holds plenty of goodies or an old-fashioned hat box. Finish off your wrapped presents with bows and ties made from yarn, string, fabric scraps, ribbon, paper doilies, construction paper and yarn pom-poms. Make gift tags out of recycled cards, handmade paper snowflakes or stars and cardboard cut-outs. Nothing says “welcome to my home” than aromatic potpourri! 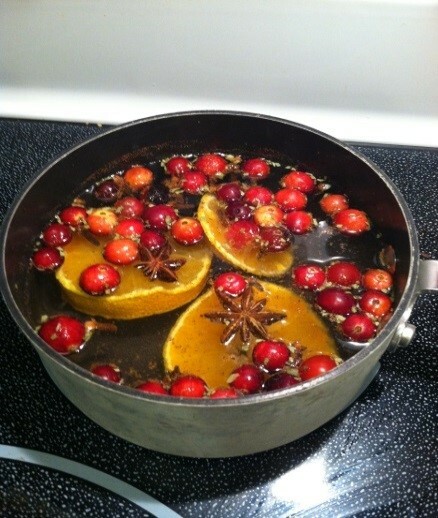 Chose some ingredients you have on hand, put in a pot of water or apple cider and simmer on low. Try fruits such as apple, orange lemon, lime or raisin. Look through your spices to add clove, ginger, cinnamon, bay or mint leaves, nutmeg, star anise or vanilla. Experiment to find your favorite combination! So you’ve found some great ideas and want to add color to your decorations. If you don’t want to use traditional food coloring, dyes, inks or paints, the following items will give you the vibrant colors you’re looking for: beets and pomegranates for red/pink; spinach and parsley for green; blueberries and red cabbage for blue; turmeric and saffron for yellow; coffee, tea or cinnamon for brown; grape juice for purple and finally carrots and paprika for orange. You can be proud of your Christmas decorations and know that you’re doing your part to take care of the Earth. Now go scavenge around your house, make some unique decorations with your family and have a wonderful, eco-friendly Christmas! 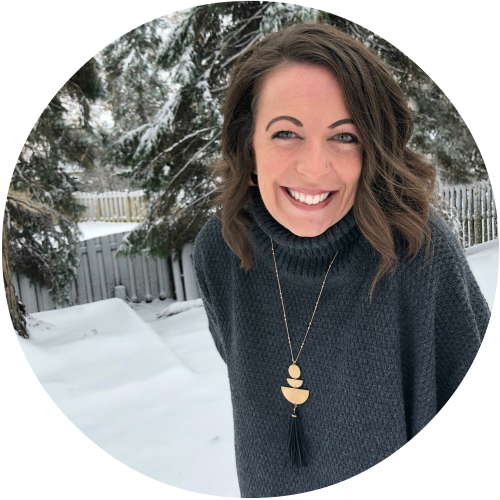 Mary Soroka is a freelance Christian and mental health content writing/marketing professional from Colorado. She’s a wife, mother, singer and instrumentalist striving to engage, inspire & enrich others! She composes fiction & non-fiction pieces for adults and children, enjoys animals, reading , crafting, gardening and playing in the great outdoors. Check out Mary’s website at www.penworksink.com.